Track mobile add campaigns, app download details, kind of media consumed and more. With every passing second more and more companies are adopting mobile devices like Tabs and IPads in the workplace. BYOD is the hot topic in most of the companies and CIOs are not shying away to understand the implications and limitations of these devices. At the same time companies have taken initiatives on mobile platforms to increase their reach, improve sales, enhance marketing efforts, understand customer behavior, predict future growth and revenue. Though the future is mobile but it comes with its own sets of complexities. Its an addition to the existing arsenal of any company’s strategy that means more data being generated through multiple devices. 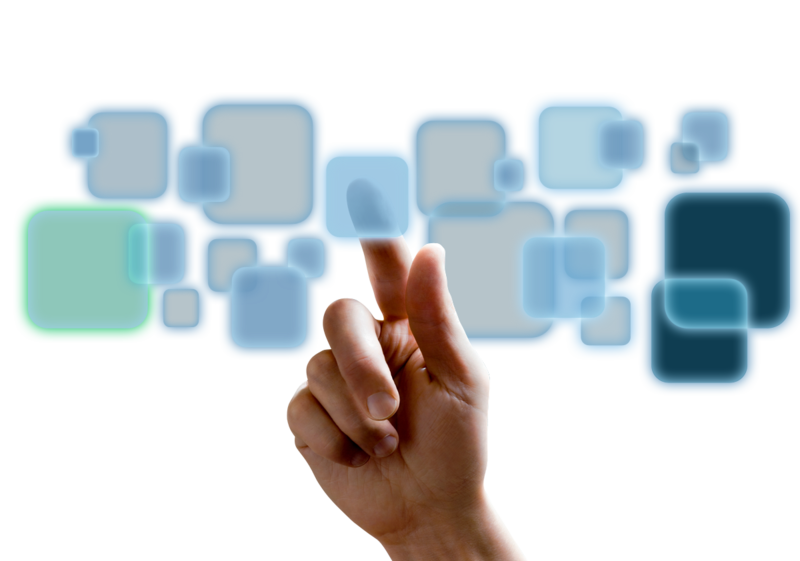 Data is being generated at an alarming rate from multiple avenues like mobile and other virtual and real-time aspects. The problem is not the data but to make sense of this overwhelming accumulation of data. Companies often struggle to gather the data from disparate sources, filter it and transform the insight into necessary actions. And, this situation makes it more important to have a mobile business intelligence solution in place. Another challenge faced by the companies is regarding trained professionals who can help them make sense of the data and train their employees at the same time to be independent in the use of mobile business intelligence solutions. There is an overwhelming demand for mobile business intelligence. With each passing day more and more companies are adopting mobile analytics solutions to extract meaningful information from the ocean of data generated by their mobile initiatives. Top businesses have already attacked this opportunity and are gaining significant advantage over others. These companies have been able to answer many questions which were locked to them previously. Business critical metrics such as customer behavior, revenue generated per customer, time spent on site and other activities related to the business and more are visualized in the simplest ways to take informed and accurate actions. CIOs are increasingly becoming mobile savvy and want to have a mobile business intelligence software that can provide them real time information. Being mobile means “flexibility” and companies are giving more authority to their employees like many companies have provided Ipads to their sales reps that can use mobile BI on the field as and take informed action with just a click and at an amazing speed. EzDataMunch provides mobile business intelligence solutions that are comprehensive and robust with the ability to extract information from multiple platforms with ease and transform the data into highly meaningful and actionable visual report. 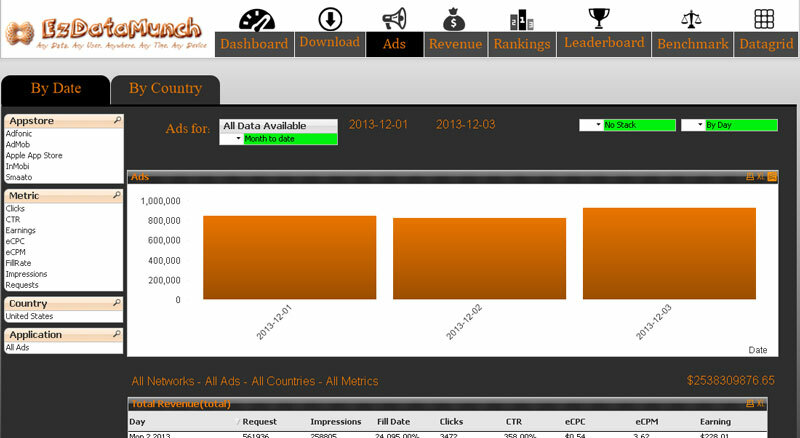 Measure click through rate from multiple mobile advertising campaigns and revenue generated. Check rankings by getting insight into the factors causing adds to rank. Target relevant audience based on their interest and demographics. Track number of impressions, expenditure and ROI from mobile campaigns. 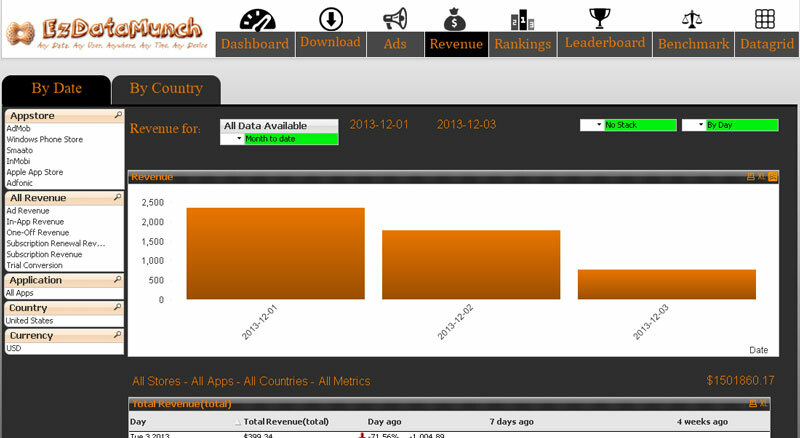 Our pre built mobile analytics dashboard gives real time insight into the sales done by mobile apps. Users can get complete overview of revenue, average revenue per user (ARPU). Complete insight into total number of paying users and more. Customer engagement is one of the most important metrics that gives insight into customer behaviour and time spend on the app. 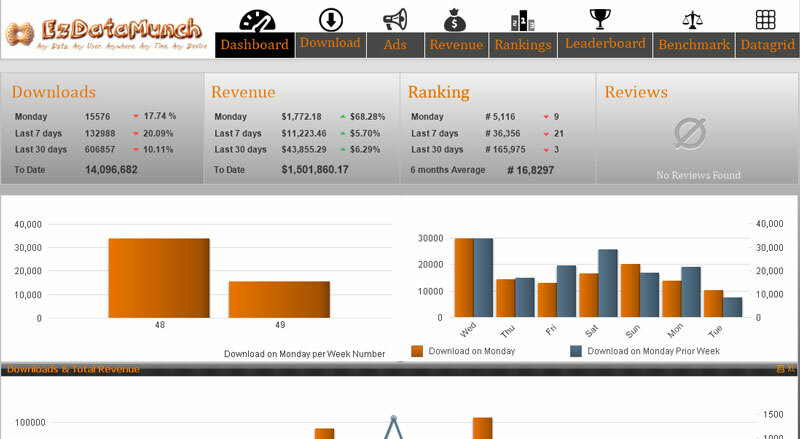 Our mobile analytics dashboards gives complete information regarding customer. The points covered are total time spent, frequency of visits, paid or unpaid, usage patterns and more. This data can help in accurate future prediction of customer behavior and take necessary actions for retention. 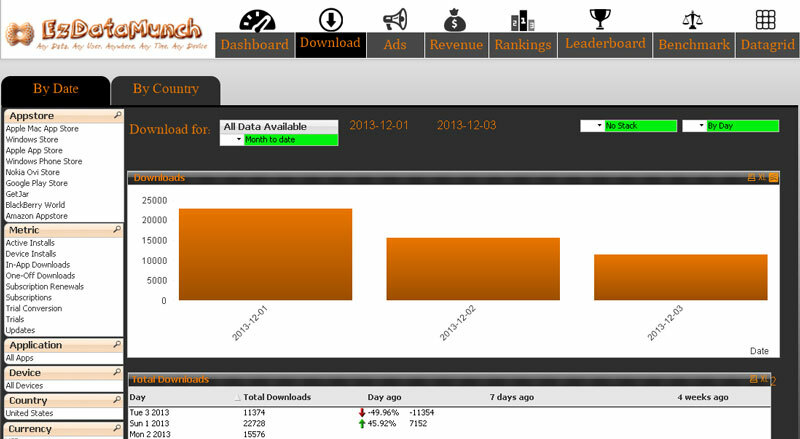 Users can view complete information regarding most important metrics such as downloads, revenue, ranking and reviews. This dashboard makes it easy for the user to customize it as per their preference and provide real time information. The dashboard can be filtered as per the period to track changes and identify trends to take better decisions. We wanted to analyze our Travel and expense spend across business units. The challenge was analyzing travel spend through “Concur” that was only providing partial insight. To do a more holistic spend analysis, we needed to consolidate data across various sources like Concur, HR data, P-Card data, Travel agency data, Contract data for hotels / car rental companies and business rules and policies to ensure we can analyze compliance to organization policies. 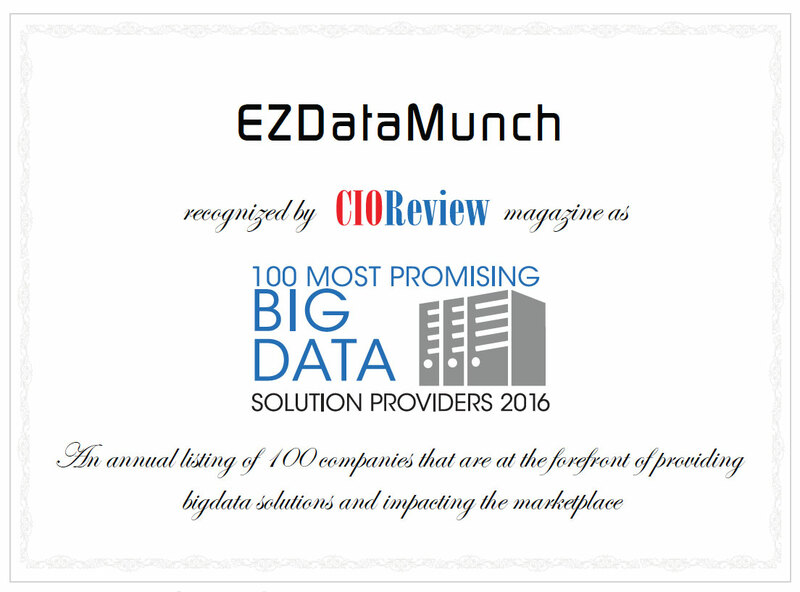 After comparing multiple solutions out there in the market, we selected EzDataMunch as they had the most comprehensive playbook. We were able to analyze data as we needed, a simple user interface, data uploaded in cloud and best of all – we could see the savings of almost $2.5Mn in 60 days!